The state of your property can say a lot about your business, your windows need to look great to complete the look. NICK’S Window Cleaning provides full Oakville commercial window cleaning services to clean your windows and help your property look it’s finest. Our dependable, trustworthy service is performed by uniformed professionals and available as a scheduled cleaning plan, or as a one-time cleaning. 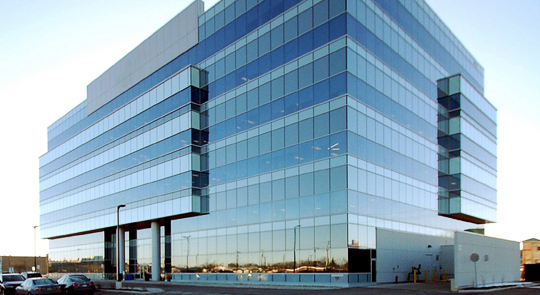 We provide full commercial window cleaning in the Oakville region; housing complexes, office buildings, condominiums, churches, and all other commercial or industrial buildings. Get a free no-obligation estimate today. When you call us for a free estimate we take into consider all of your needs. 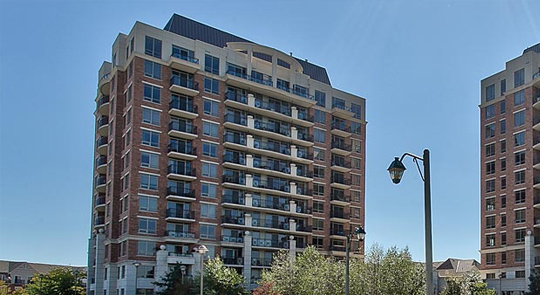 We provide custom service that meets the needs of Oakville commercial properties, explain to us the details of your project and we will put together a custom package to fit. If you are interested in a simple exterior cleaning, we will put together a simple plan. Alternatively, if you have a plan you would like us to follow; we will accommodate your needs. We feel a custom approach is the best match for commercial properties rather than offering set packages. No two properties are alike and this method allows us to meet the needs of a broad range of customers in the Oakville commercial sector. From housing complex to multi-level office building window cleaning, we provide dynamic solutions to your window cleaning needs. With six day a week availability, we are there when you need us. We are on the job six days a week. This allows us to provide effective service when you need it the most. We understand there may be times when you would rather avoid the potential for disruption that may be caused by the window cleaning process. Eliminating needless disruption or downtime for your business is important for many commercial tenants and property owners. Explain the details of your needs to us; we will construct a plan suited to meet your needs. Safe, responsible execution of commercial window cleaning. We provide Oakville with safe and effective window cleaning service all year round. Regardless if we are working with long reach pole, Bosun’s chair, or using a lift device; our workers are safe and conscientious. We have full liability insurance, providing security and peace of mind. With a high level of focus on safety procedures and carrying out best practices, you can rest assured your window cleaning will be carried out under the safest conditions possible. Fast, effective, dependable service is what you will experience with our Oakville commercial window cleaners. We provide top-notch customer service and sparkling clean windows for all commercial properties ranging from low-rise housing complex to office buildings. NICK’S Window Cleaning serves all of Oakville with uniformed professional workers. 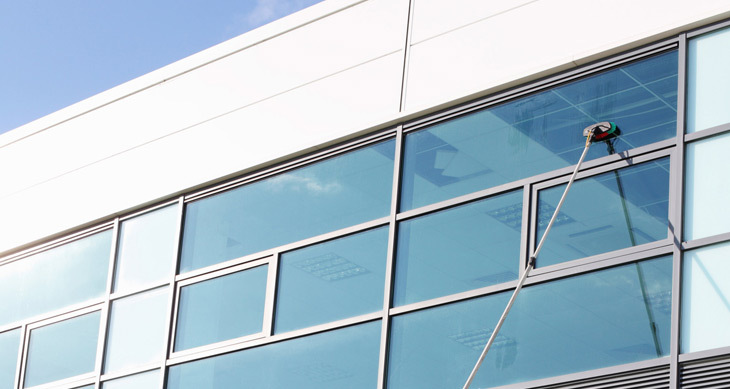 Our service covers every commercial and industrial property under 27 storeys – and you can rest assured we will make your windows look great. It is very important that you take care of your businesses appearance. Neglecting your windows is a big mistake many business owners make. Typically, business owners will forget this area as it can take a few months before windows are clearly dirty. Rather than having an employee take care of it, or attempting to DIY it themselves, many Oakville property owners and managers are seeking the services of commercial window cleaners to handle the work for them. Cleaning windows may seem like an easy task to those who have not had the opportunity to do it! Often time’s people will set out with a bucket and a rag in an attempt to buff the dirt off those windows, only to discover the dirt is far worse than they had anticipated. It is about this time that people give up or settle with the idea that they windows will probably never look as good as they are hoping them to and move on with business. Rather than settling for second best, or wasting your precious time on cleaning windows hire a pro! Hiring a professional commercial window cleaner is one great way to ensure your windows look great and you can devote your time to running your business. Window cleaning takes a certain finesse. Skill is built through experience, and experience is built through knowledge, without the right combination of tools and training there is no way a person is going to get fast excellent results. A professional window cleaner will not only make your windows clean, but make them look great! Customers and clients will be able to see clearly into your place of business and the sparkling gleam of the window from the exterior can be a thing to enjoy. We love clean windows! Oakville is a bustling, growing region. 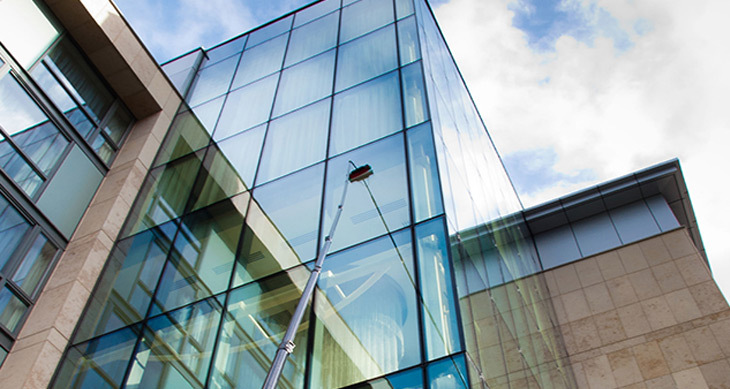 If you are looking for a professional window cleaning team for your commercial property, look no more – you have found us! Contact us today and discover why more people are choosing NICK’S Window Cleaning for their Oakville commercial window cleaning needs.